Certain topics of ranch life are seldom shared with the public, but risking to offend the politically correct, I offer our ‘Practice with Coyotes’. A couple of decades or more ago, I took a page from Dayton Hyde’s book, Don Coyote, and let the coyotes on the ranch alone, hoping their population would stabilize to fit our rodent population. We ran stockers then to help cover the expenses of our cow herd, and the coyote’s threat to our commercial calves was minimal, in part because our mother cows were a diluted heterosis of Hereford, Angus, Brahma and Longhorn mix that could fend for themselves and their calves. In those days, we really didn’t have a breeding program. We bought good bulls and our good mothers stayed, but their multicolored and uneven calves became increasingly difficult to market. Though I admire Hyde’s experience and philosophy, I haven’t convinced the coyotes to leave our small Wagyu-cross calves alone. From a coyote’s perspective, a pasture scattered with first-calf heifers and sleeping, fifty-pound calves does not go unnoticed. Thirty to forty pounds lighter than our straight English calves, the Wagyu bulls allow us to breed yearling heifers instead of two-year olds, but the Wagyu-cross babies are too tempting for even the shyest coyote. Primarily tied to the rodent population, ground squirrels, gophers and mice, coyotes also clean-up carrion that limits potential diseases on ranchlands. Between the feral hogs and coyotes, the eagles and vultures, a wild or domestic carcass doesn’t last long. But ultimately, it is the variables of winter temperatures and rain, grass growth and seed that dictate our rodent, and hence the coyote’s, population. From an economic standpoint, a Wagyu-cross calf can generate $800-900 seven months after it’s born. The extra costs associated with breeding a yearling heifer, keeping her in shape to raise her calf and breed back again might total $500-600. Each heifer that loses a calf can get costly in a hurry. Daring to play coyote psychologist, we don’t want our calves to become the new main course, our calving fields the easiest place to go for a free meal, so we discourage their presence by beginning in August, a month before calving, with a rifle. We tend to leave the coyotes alone by January, as most our calves are big enough by then to take care of themselves. So what do I know? What seems to be our impact on the coyote population? Depending upon our competence with a gun, I’d like to believe that we have become part of the natural selection of the coyote, eliminating the slower and more naïve individuals, and educating the rest. 60-70% of my 15-20 coyote kills in August are juveniles, almost full-grown, but most of which would probably not kill a calf in the year they were born. By the end of September, I might shoot five more, almost all adults, and maybe five more adults by December, by which time the juveniles look like adults, especially with longer hair. 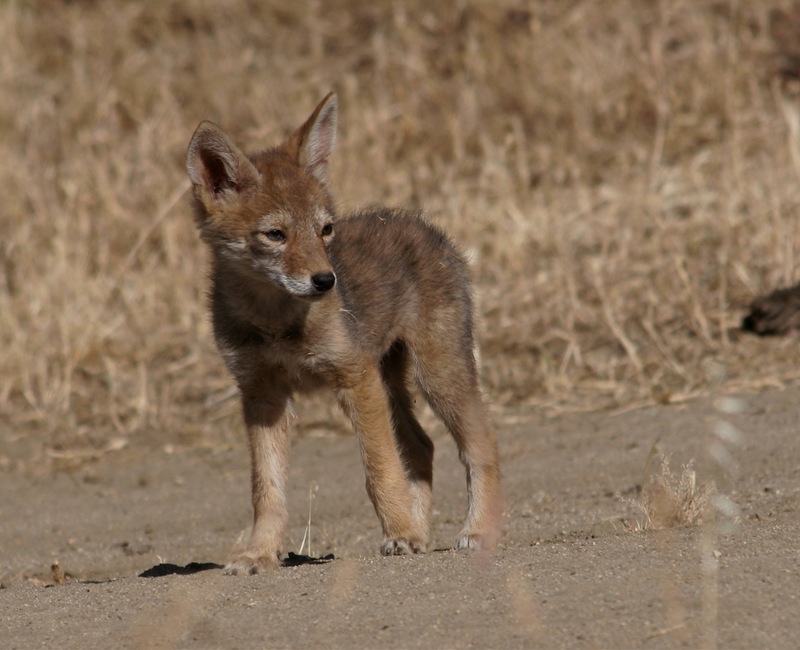 Over the past decade, the coyote population remains vibrant, vacillating with weather conditions and food supply. At no time have I entertained the notion that I have truly impacted their numbers, though I do believe I have discouraged their presence in certain pastures, which is what I’ve intended. Looking back at the days when the use of 1080 squirrel poison was commonplace, we may have had less coyotes. But it also seems in the 1960s that we had many times more ground squirrels, despite the poison’s 95% success rate. Because 1080 would also kill other species that might consume the poison-coated grain, retained in the carcass, it would also kill whatever fed upon the carcass before it became illegal to employ. This was especially good for the coyote. Comfortable in town and Valley orchards, the coyote may be one of our most adaptable species, and most admirable in these quickly changing times. Even the Native Wukchumni identified themselves with the coyote, a clever symbol of self-reliance and survival that yet endures here. Wondering, with the amount culling you do, do you still have any losses? Also, since cougar hunting has been stopped do you have any losses from them? I would think they could be a problem if they got started.